Welcome friends with a farm-to-door wreath. 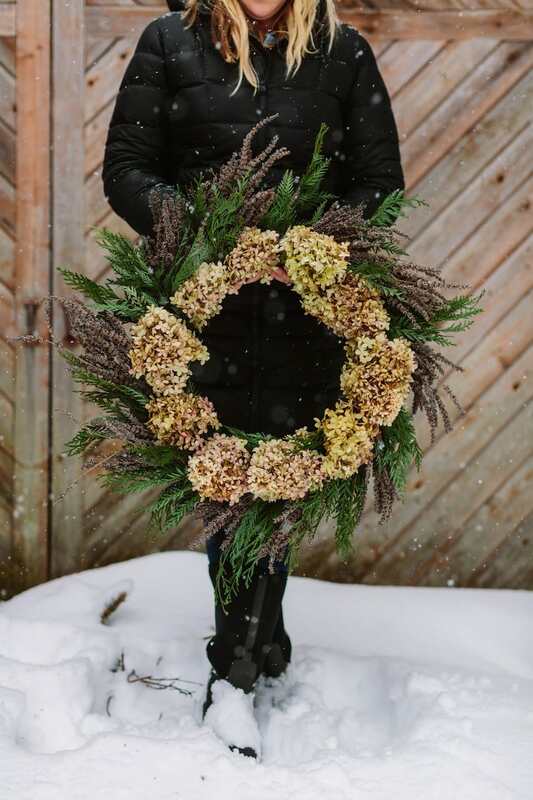 Petoskey floral designer Kalin Sheick of Sweetwater Floral shows us how. Classic lake effect. Snow is coming down at more than an inch per hour and it’s white, fluffy and picture perfect. It also helps to hide the parts of this small farm that aren’t the best. The winter here is a time for a blanket of white to wipe the slate clean. From the windows in our kitchen looking out, it seems that there are no projects that await us, as they do in spring. This fresh beautiful canvas is what makes slowing down during this time of year so easy. On a December day in 2015, my husband and I, both 20-somethings from the suburbs, unloaded a U-Haul and got to work on a scraggly 10 acres with a barn full of junk. The weather that day was unseasonably balmy. I like to joke that it was an act of kind karma from the weather gods, making it seem like this entire project would be easy. We had sold the cutest house you could ever imagine in Cadillac, and moved north to be near our favorite place, Walloon Lake. My parents live on Walloon, and the summer before we’d been married in their backyard. We knew that if we wanted to lay our roots down in Northern Michigan for the long haul, it had to be nearby. I never really knew where the farm would lead us. I knew lavender was in the plan, and honestly thought it would just be a small farm. But slowly, as the plants matured along with us, we realized that it was a special gathering place for memorable, intimate and special events. In the summer of 2016, I started an event called, ‘The Gather Series’, a monthly dinner party where we invited strangers to our table, set in the field, to enjoy the best dishes from local food vendors. It was an instant highlight to our adventure here at Sweetwater Floral. As a floral designer for weddings, my summers are jam-packed. We also regularly host yoga, private events, flower workshops and meditation. Somewhere in that schedule, I make it a priority to jump in the lake, take a nap in the lavender and have plenty of family time. All of that, paired with the lavender bloom in July, makes the seasons fly and in what feels like a blink, snow is falling again. Our first full winter here I taught myself to make wreaths with stuff I cut from around the yard, and before I knew it we were hosting wreath workshops. I’ve always loved wreaths. They are a symbol of hospitality, something we take pretty seriously here at our tiny farm wedged between Walloon Lake and Little Traverse Bay. And Northern Michigan is bursting with the best materials you can imagine for making your very own evergreen wreath. 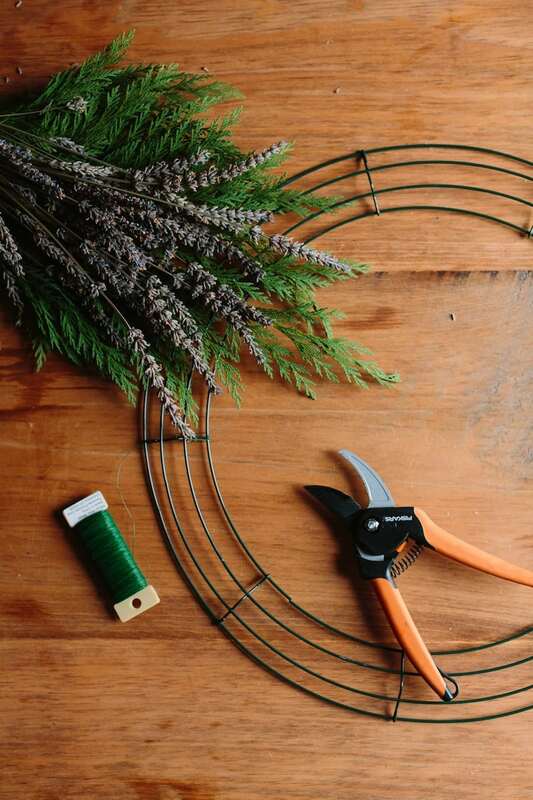 I put it out there that I was going to host a workshop in the barn, I’d teach everyone how to make an evergreen wreath for the holidays and we’d have a glass of wine and eat a cookie and listen to holiday music: it sold out in less than a week. 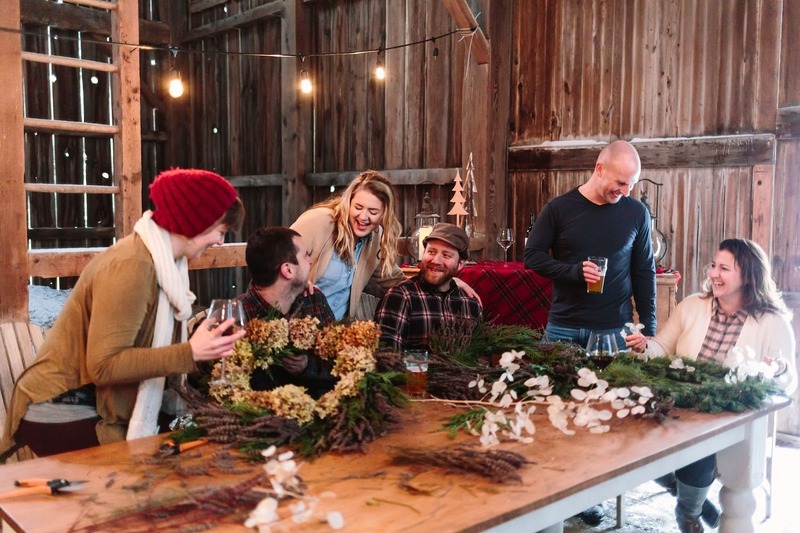 That first wreath party has turned into five wreath workshops hosted in the barn each season. In all, we teach about 100 people how to make their own wreaths, a lifelong skill I hope they take with them to utilize season after season. And as the farm continues to feel more like our dream come true each day, I’ve learned the importance of slowing down, inviting friends over, and entertaining with no fuss, just fun. The wonderful thing is, that anyone can throw a wreath party, whether they own a farm or not. Making the time for this special afternoon with friends in the midst of the busy holidays is a wonderful gift. Take it from me, you don’t have to wait until your house is perfect, barn is ideal, or you’ve become a better cook to start hosting. Time is a nonrenewable resource, and we only have so much. Fill your table with people you love, something delicious in a glass and magic will happen. Don’t stress about decor or tablescapes, I’ve found that when entertaining the more simple and seasonal I keep it, the more impactful it is. Nothing makes my heart happier than a table filled to the brim with natural materials being used to make a wreath. Other moments I love from these parties: letting candles burn down, the clinking of glassware and relaxing with friends. I wish for you a place you can gather, a table you can sit around and the real connection shared over that table. I wish for you the moment the conversation goes up an octave and a champagne cork pops. I wish for you a dog sleeping under the table and that comfortable feeling that comes from surrounding yourself with family and friends. 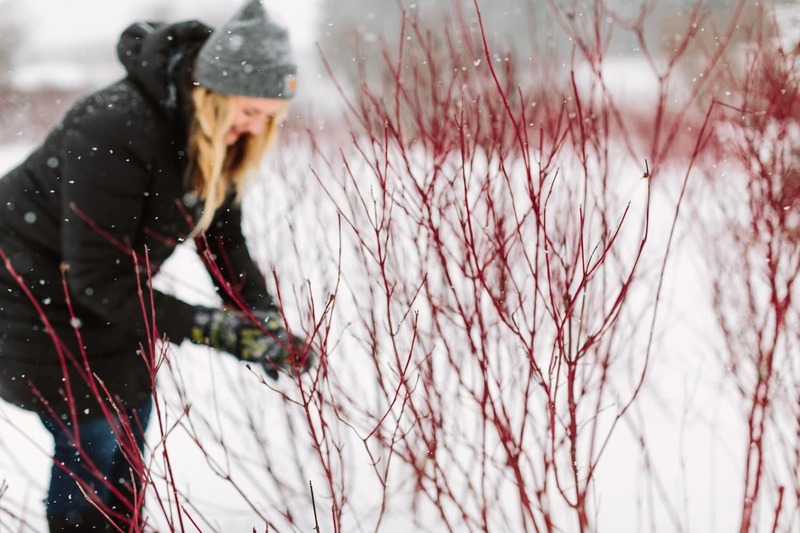 The farm has an entire field of red twig dogwood to cut from. I also forage cedar, pine and anything evergreen. Dried flowers are a dream to work with in wreaths. We dry thousands of bundles of lavender each summer, some of it for our wreaths. I also cut and dry hydrangea in the fall to use in wreaths. Give each guest a wreath frame and paddle wire (found at any craft store), garden scissors or ‘snips’ and room to work. Encourage your guests to try funky combinations of materials and get creative. Half the fun is seeing what everyone comes up with. Your wreath will be constructed of small bundles of your foraged material attached to the wire frame with the paddle wire. Select the material for your bundle. Know that you will want all of your bundles to be fairly uniform in size. Cut a length of paddle wire that is long enough to attach to the frame and wrap the bundle several times. Attach (by twisting) one end of the wire to the wire frame near its center. Holding your bundle on the frame, wrap the paddle wire around the frame at least twice, tightening as you work, to secure your bundle. Repeat the steps, working around the frame until you are finished. Kalin Sheick is owner/creative director of Sweetwater Floral. 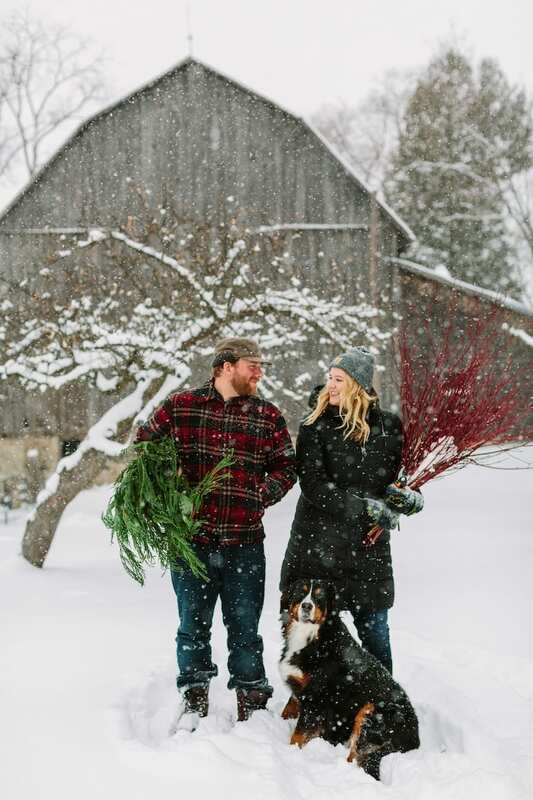 When she’s not designing stunning wedding flowers, you can find her stomping in the snow at her Petoskey farm with her giant dogs, Maple and Wally, or clinking a glass of bubbly with her husband. // Courtney Kent is one half of The Compass Points Here, a photography and videography company based in Traverse City.